©Bert Gildart: Pope’s Tavern, located about 25 miles off the Natchez Trace, is one of the oldest structures in Florence, Alabama. Once it served as a stagecoach stop, a tavern, an inn, and was used as a hospital during the War Between the States. 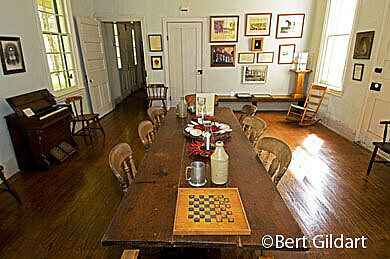 As well, rumor has it that Andrew Jackson stopped here in 1814 on his march to battle the British at New Orleans. Author, right, and Ed Anderson, former roommate, at Pope's Tavern. Those were reasons enough for Janie and me to make an 18 mile detour off the Trace, but there was yet another reason. Pope’s Tavern is located about a block from what is now the University of North Alabama, and for one year, Ed Anderson and I rented rooms from Dan and Bernice Lambeth, owners at the time. Renting the rooms allowed us more freedom than what the college offered, though the elderly Lambeth’s imposed stipulations that were similar to those imposed at the college. “Boys, there will be no drinking,” said the elderly Bernice Lambeth. “And no wild women either,” added her brother. Apartment now reverted to 1830s, used historically by travelers for drink. Normally, Pope’s Tavern is closed on Mondays, but the museum director, upon hearing that Ed and I had once lived at the tavern–and that I now hailed from Montana and was on a limited time schedule–graciously open the tavern for us. As we wondered around, we agreed that today, the old tavern looks much different from 1962, the year we rented. In fact I had to look twice at some of the features to make sure this was the same place. In 1965, the state purchased the old home from the Lambeth’s. 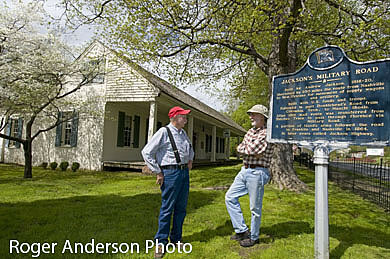 Then they conducted a major overhaul, and now you are greeted with a sign explaining the significance of the tavern and its importance to Jackson’s old military road. The road was built between 1816 and 1820, and one would have to assume Jackson’s troops stopped to refresh themselves after a long day’s march. With that knowledge, I’m sure that Ed and I occasionally followed the historic precedence created by the legendary Andrew Jackson. In other words, we wanted to absorb history. Pope’s Tavern has also been whitewashed, and the outside no longer has a drab appearance. The interior has been modified, too. 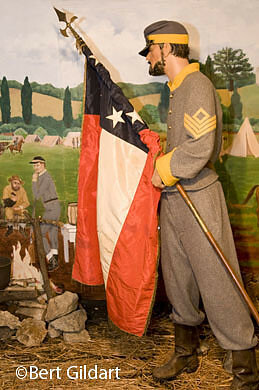 In the days we occupied the tavern, there were stains on the ceiling, and we often wondered whether the dark blotches could have been dried blood from the wounded who were tended during the period the tavern was converted into a military hospital, one which cared for both Confederates and for Yankees. Rumor had it the stains were blood, so that’s what we told our occasional visitors. During our tenure, there was no formal dinning room, but that has all been changed, and today, it has been refurbished so that it might appeal to men riding the old military road, perhaps some that detoured off the Old Natchez Trace. Oyster shells graced the center of the huge table and on one edge there actually sits a small stein, intended to be filled with a stout ale of the times. Adjacent to the tavern room was a parlor where female guests might sit. The room contains a bust of Carlotta, considered the most beautiful woman or her times. Carlotta and her husband, Maximillian, were appointed rulers of Mexico by Napoleon. 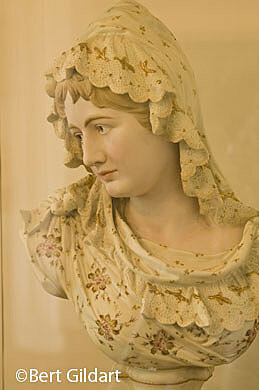 The bust, according to the museum write-up, was made in Australia and presented to the couple by Napoleon as a wedding gift. At the time of our stay, the attic was simply a storage area, but today, stairs lead to a collection of Civil War memorabilia, to include a diorama and a rack of rifles that were probably .50 caliber. Ed noticed some had been bored out and so converted into 20 gauge shotguns, a common practice, he said, after the Civil War. Though the tavern had been greatly embellished from our one year stay, the old home brought back interesting memories of two young college men, infused with a bit of the devil. Ed recalled that Bernice Lambeth had but one eye. Ed also recalled that one night her brother Dan joined us in what was our kitchen at the time, doing so just before a football game. He recalled that the elderly man imbibed several drinks, the source being the case of beer we had smuggled back from Tennessee and into what was then a dry county. But for a while, we lived in the shadow of history and without exaggeration, I can say that eventually memories of our intimate association with history took me back to the Natchez Trace, a park that has become somewhat of an obsession. And without qualification, it was because of our association with old Pope’s Tavern. This entry was posted on Friday, April 17th, 2009 at 4:59 am and is filed under National Lands, Photography, RV Travel, Travel. You can follow any responses to this entry through the RSS 2.0 feed. You can leave a response, or trackback from your own site. this is very interesting from the standpoint of history and the history of “Ed and Bert”. I really enjoyed learning of this.